If you recall my post on where you’re most likely to find a job, I didn’t exactly rate job fairs very highly. But that does not mean you should ignore any opportunity or resource during a job search. And in this job market, job fairs and career fairs might be an unusually valuable resource. 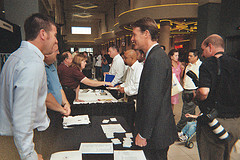 Think about it, a job fair requires a significant investment from a company, in terms of money, time and manpower. So there’s unlikely to be an employer showing up to a career fair without a real and immediate need to fill. So here’s a quick checklist of how to find, attend, and find a job at job fairs and career fairs. Job fairs are by their very nature local affairs. You don’t want to attend a job fair in Chicago unless you plan on living there. And so job fairs are advertised and publicized very much like concerts are (they’re held in some of the same venues). You’ll hear ads weeks ahead of time on local radio. Your local newspaper might be the best source to find out when a job fair is coming to town, for the simple reason that your newspaper might be part of the organizing force behind the event. So check your local classifieds section as well. There are some web resources that can help you. National Career Fairs is one. EmploymentGuide has another online resource. CareerBuilder is another place to find a lot of local career fairs scheduled, again, because CareerBuilder IS your local newspaper company in disguise. Get your resume in order way ahead of time. Don’t leave this to the last minute. Engage some professional resume writing help, or at the very least, get a friend to give you some feedback and proof-reading help. Unless you’re 100% sure of the company you want to work for, your career fair resume should be very, very general. You’re gonna want to be able to use the same resume for multiple companies, maybe even multiple industries. Most importantly, bring lots of different copies of your resume. You want to hand it out to as many people as you can, and you don’t want to run out. But don’t fold your resumes into your back pocket. Invest in a professional looking folio or portfolio. Don’t be carrying your resumes in a stack in your hand. Or in a ratty little paper folder. Use a nice fabric folio or professional briefcase. Do your homework ahead of time. Most career fairs will advertise at least some of the employers that will be attending. This is a golden opportunity to do some research and learn about the companies ahead of time. You’ll definitely stand out from the crowd if it seems like you know something about the company, it’s products, it’s market/industry and it’s philosophy. Professional dress is an absolute must. Think of a job fair as speed interviewing (sorta like speed dating). It’s not exactly a formal interview, but you want to look like you would at a formal interview. Professional dress absolutely. Wear comfortable shoes. You’re gonna be standing in line a lot. Get there early. In case you haven’t heard, these days, the lines are around the block for popular job fairs. Show up with an elevator pitch for yourself. An elevator pitch that is a 20-30 second summation of who you are, what your qualifications are, and why you should be considered. Imagine the moment: you’ve handed your resume across the table. The hiring person is scanning it with their eyes and they say, “So, Bruce, why should we consider you?” That’s your elevator pitch. Have it written out and memorized ahead of time so that you can deliver your elevator pitch confidently and consistently. Collect all the business cards, email address and phone numbers you can. Bring something you can carry these items in. Or load it all into your cell phone. You shouldn’t think of a job fair as just a place to drop a bunch of resumes. It’s also a place where you should collect a bunch of valuable intel and contact info. Be chipper, cheerful, alert and attentive. And polite. Introduce yourself. Smile. Be the first to initiate a handshake. Those that are assertive at a job fair will stand out. Those that are just numbly going through the lines and going through the motions will not. Use a career fair as an interviewing exercise. This is the chance for you to try out your interviewing skills with several different prospects and in several different situations. Don’t be afraid to test out different approaches. Take note of what lines work and which do not. Remember, for the employers, this is a fishing expedition. They’re just casting the net out and getting as many prospects as they can. Don’t expect to get hired on the spot. So, very importantly, conclude the conversation by asking how you might go about taking the next step and coming in for a formal interview. Network with EVERYONE. Especially the other job seekers in line. You’re all going after the same thing, but there’s no reason why you can’t trade leads and valuable info. Don’t just stand there with your ipod earplugs in. You might get your best feedback from the other attendees. Don’t have a narrow focus. I mean, shoot, since you’ve come all this way and dressed yourself up, don’t be afraid to take a flier on a few unlikely employers. Maybe employers you wouldn’t normally consider. You’ve shown up, they’ve show up… don’t waste the opportunity to connect. You never know who lightning might strike with.